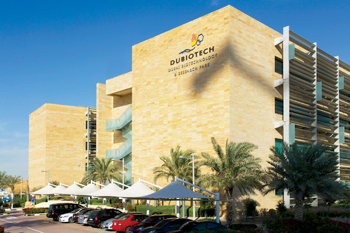 A 20 per cent rise in the combined number of new business partners in the year to July 2015 at Dubai Biotechnology and Research Park (DuBiotech) and the Energy and Environment Park (EnPark) reflects Tecom Investment Free Zones (IFZs)’ popularity as a regional springboard for businesses, a statement from Tecom said. As many as 45 new businesses registered at the two IFZs, located in Al Barsha South. The number of companies in both business parks now totals 269. Well-known companies such as Pfizer, Amgen, PepsiCo, Bayer, ThermoFisher and First Solar have made these IFZs their home, providing an innovative community for all businesses looking to utilise best in class infrastructure and cutting-edge research and development facilities, the statement said. The free zones support both start-ups and international firms looking for a regional base for their Middle East or global operations. Tecom Investments announced last year an investment of Dh4.5 billion ($1.22 billion) as part of a broader Dubai National Innovation Strategy. DuBiotech and EnPark both support Dubai’s goal of becoming one of the most innovative cities in the world.